A revised Illinois Accessibility Code went into effect on October 23, 2018, and includes several changes that Illinois and Chicago developers should know. I interviewed Denise Arnold, MAPS’s accessibility consultant, about five significant changes. She has been consulting architects and developers for 13 years, and previously served as the architectural services director in the Mayor's Office for People with Disabilities. Projects that will start construction after October 2019 will have to comply with the new code (download it here), and the Chicago Department of Buildings will start reviewing permit applications for new IAC compliance in May. In the previous version of the Illinois Accessibility Code (IAC), every accessible perpendicular parking space needed an access aisle on the right side. Chicago has always allowed there to be shared access aisles for adjacent perpendicular parking spaces. The Illinois Attorney General's office, which enforces the IAC, had allowed shared access aisles, "but many developers didn't want to chance it", Arnold said. "Now developers can feel free to build the shared aisle because both the Chicago and Illinois accessibility codes allow it. The impact may be that it adds some flexibility to parking lot design, by giving five feet back (when two accessible parking spaces are required) to the architect to use for landscaping. If more than two accessible parking spaces are required, the savings may even result in an additional parking space. Angled parking spaces still need their own access aisles on the passenger side. New construction multi-story housing developments (four or more stories containing ten or more dwelling units) must provide 20 percent of the units as adaptable (section 233.6.4). According to the Illinois Accessibility Code, section 233.6.5.1, an adaptable dwelling unit is "designed and constructed so they may, upon application by the occupant, be converted to accessible units, with a minimum of structural changes…". For example, in bathrooms in adaptable units, there should be blocking in the walls to install grab bars. In the past, the code didn't state who was responsible for paying for the conversion when a tenant or purchaser who needed an accessible unit was going to move in. The updated Illinois Accessibility Code clearly states that the building owner pays for the conversion cost (section 233.6.5.1). "The ambiguity is now gone. It's in state code, and the owner has to bear the conversion cost", Arnold said. Changes to the Illinois Accessibility Code now match and even exceed the Fair Housing Act's standards for accessing laundry machines. At top loading laundry machines, the clear space for parallel approach must be centered on the appliance. At front loading machines, the clear space shall be offset from the centerline of the door opening by no more than 24 inches. 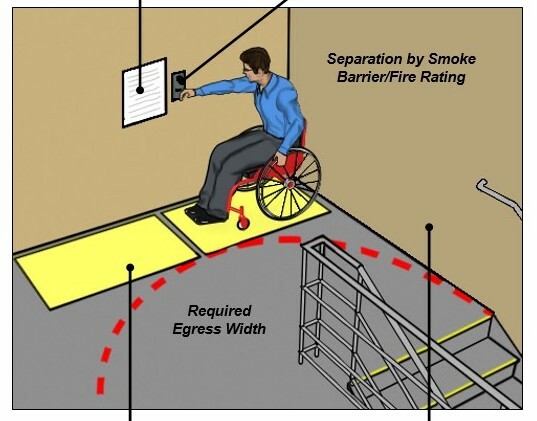 In the updated Illinois Accessibility Code, the area of refuge is no longer required in multi-story residential buildings that have a fully automated sprinkler system. There are additional new exceptions; refer to sections 506.3 and 506.4 to view the complete list. Arnold recommends an area of refuge in all residential designs, and especially in senior and assisted living buildings. Another change in the Illinois Accessibility Code is to modify the kitchen storage rules (in covered dwelling units) affecting cabinets and drawers. The new rule gives architects and interior designers more flexibility in designing kitchens in dwelling units in multi-story housing. For example, with the old rule the lowest shelf of the upper cabinet had to be at 48 inches above the floor, it typically wasn't possible to install a cabinet over the sink. That reduced the overall volume of kitchen storage. "This rule affected the look of the kitchen, and a lot of developers would fight that one all the time", Arnold said. The new rule says that five percent (of the lineal length of shelving, cabinetry, or drawers) but not less than one of each type (drawers and cabinets) has to be accessible. For example, just one upper cabinet would have be lowered to 48 inches above the floor in the new rule. "These changes should give the designer more leeway to figure out how to design kitchen storage and upper cabinet storage", Arnold said. "These laws are here so that someone can perform daily living skills independently", Arnold said. "It's all about people being able to independently maneuver around their apartments, get outside to their car or on the sidewalk to get to the bus, or do their own laundry". Contact us if you have any questions about the updated Illinois Accessibility Code.